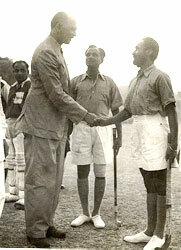 Tiwari became Dhyan Singh's guru and laid the foundations of his game. Tiwari made one thing clear to him - although his dribbling was awesome and could win him much applause, hockey was a team game and he should not hang on to the ball for too long. Tiwari and Dhyan Singh had no fixed time to play. In fact, Dhyan played hockey a lot as that was the only outdoor game his regiment played. hyan Singh joined the Army in 1922 as a Sepoy in Delhi's First Battalion of the Brahmin Regiment. He was 16 years old. When Dhyan received his first pay of just a few rupees, he was very thrilled. While in the Brahmin regiment, he came into contact with his Subedar - Major Bhole Tiwari. A keen enthusiast of the game and a good player himself, Tiwari recognised the talent in Dhyan Singh. He became Dhyan's guru and laid the foundations of his game. Tiwari made one thing clear to Dhyan - although his dribbling was awesome and could win him much applause, hockey was a team game and he should not hang on to the ball for too long. He should pass the ball at the correct time. One could score goals not only by hitting powerfully, but also by clever placing and pushing of the ball. The British officers also encouraged Dhyan Singh. He learnt from them their dedication and their 'never-say-die' attitude. He started thinking a lot about the tactics of hockey. He assimilated all the suggestions and strategies that he received from others, and supplemented them with his own dazzling style. After an year of practice, Dhyan Singh's game began to flower.